In the mood to consider something different? 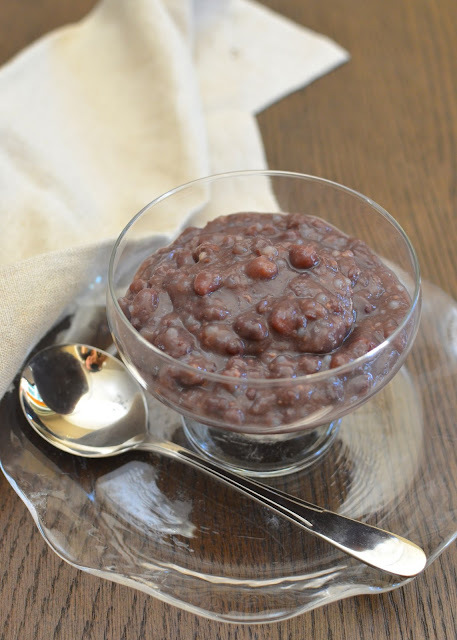 It's time for another Asian dessert, this one using red azuki beans. Dessert soups are very common in Chinese culture. I've talked about a few in the past - from a sweet potato one, to taro-tapioca, glutinous rice balls, and my husband's favorite, mango sago. This red bean dessert soup is a very common one, often served at the end of a meal in a Chinese restaurant or as a dessert in a Chinese banquet (for say, a wedding). After seeing a recipe for it on a blog recently, I realized I'd never made it at home so why not give it a try! There are just a few ingredients in this red bean dessert soup. The main one is the red azuki beans. Red beans are very popular in Chinese and Japanese food - whether as a sweet paste stuffed in buns or pancakes, or as a filling in cake, or in the form of popsicles or ice cream, to name a few uses. One of my favorite food memories growing up, in my early days in Hong Kong, was of eating little red bean pudding cakes that were served on a stick. 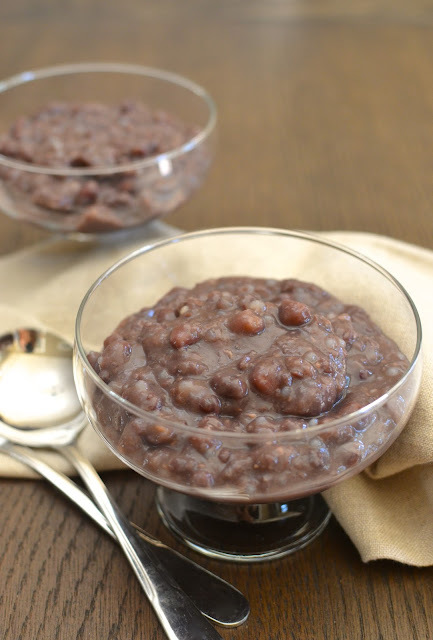 I really love all things red bean but I don't get to enjoy them nearly as much as I wish so I'm making up for things a bit today by whipping up a batch of this red bean dessert soup. Besides the beans, all you need is water, sugar to sweeten, and, if you feel like it, a few tablespoons of tapioca pearls to thicken things up a little further and give it a fun extra texture. This soup is often flavored with tangerine peel (or you could use a little orange zest, as I've seen suggested). I opted to omit this because in all cases where I've had red bean dessert soup flavored with tangerine peel, the flavor has always been too strong for me. I never knew what it was for the longest time but I knew I didn't like it all that much. As for the cooking process, the beans should be soaked for a few hours and there will be about 1 1/2 - 2 hours of cooking time on the stove. I know stovetop cooking isn't the most appealing thing in the summer but I tried to make up for it by cooking this and chilling the soup to serve cold. While this is typically served hot/warm, you can usually enjoy most Chinese dessert soups either hot or cold. I am extreme - I like things either really hot or really cold! The benefit, to me, of chilling the soup is it thickens up rather substantially (it's almost pudding like) and personally, I like a thick hearty texture. If that's not your preference and you prefer a more fluid "soup", serving it at room temperature would be a better option. I was inspired to make this after seeing a recipe from The Woks of Life (I really liked their idea of adding a little bit of tapioca pearls right at the end). I also looked at a few other recipes online and tried to adapt the process into an easy one for myself. So...to start, soak some red beans. I used 1 1/2 cups of beans; you can buy them from the bulk bin at Whole Foods. Take a look through them and pick out any "off" beans that look dried or shriveled up. I've seen varying times for soaking the beans, from a couple of hours to overnight. I happened to soak mine for about 5 hours. The longer you soak them, the quicker they cook and break down/soften. After soaking, drain the beans and add them to a pot, adding enough fresh water to cover the beans by about 2 inches. Bring the mixture to a boil, then turn the flame down to a low simmer. Simmer, stirring occasionally, until the beans soften and begin to break down. Mine took about 1 hour to reach the stage you see in the picture below. As I cooked the beans, I kept the lid on and didn't see the need to add more water but if necessary, do so. At this point, I took a handheld immersion blender and blended the soup just a little bit. I definitely prefer to keep the chunks and texture so I took a very light hand with it but this is a matter of preference. Blending it a little helps thicken and flavor the soup. In Cantonese, this dish translates to red bean "sand" and I think that "sand" reference refers to the somewhat gritty texture you get as the beans break down and you blend some of it into the soup. Now, sweeten the soup to taste. You can use Chinese rock sugar (I've used it here) but I decided to keep it simple and use plain granulated sugar. I used about 6 tablespoons of sugar but taste (this may not be sweet enough for you) and adjust it to your own liking. If you do chill it like I did, remember that the sweetness will be a bit more muted once cold. As you stir in the sugar, turn the heat up to about medium to medium-high to melt it. Feel free to serve the red bean dessert soup warm or at room temperature, as it's usually done, at this point (or why not have some now and chill the rest?). If you want to chill it like I did, let the soup cool to room temperature, then cover and refrigerate it overnight. It will thicken substantially...and you kind of have red bean tapioca pudding! You could drizzle a little evaporated milk (or coconut milk) on top if you like. It would taste great and is also a great way to thin the soup out a bit, too, if you like. I kept mine simple, just as is. This was a fun change for dessert! Take a look at the azuki beans and pick out any dried or shriveled beans. Rinse and soak for 2 hours, up to overnight (I soaked mine for 5 hours). Drain beans and place into a medium saucepan. Add enough fresh water to cover the beans by 2 inches. Bring to a boil, then reduce heat to low. Simmer, stirring occasionally, until beans are softened and begin to break down (about 1 hour in my case). If necessary, add more water to the pan during the cooking time. Using a handheld immersion blender (or transfer some of the soup to a blender), carefully blend a little bit of the soup to your desired consistency (I like mine with more whole beans and texture so I blend it very slightly). Turn the heat up to medium to medium-high, and stir in enough sugar to taste. 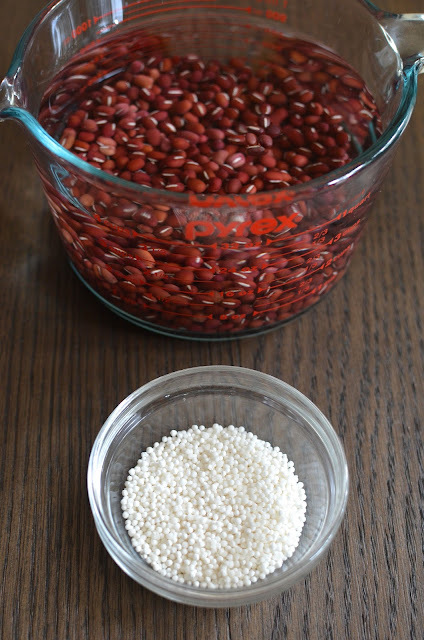 If using, add tapioca pearls, stir, and let cook (stirring occasionally to prevent sticking on the bottom of the pan) on a gentle bubble, for about 20-30 minutes, or until tapioca pearls are translucent. Haven't had any red bean dessert in ages and you have me crave some now! So intrigued by this... Never tried it but would love to give it a go, thanks for the inspiration, Monica! Thanks, Aimee! Glad to hear that. At the restaurants, it will be served hot/warm and so far more "soupy" than thick like this. Worth a try! Hope you're enjoy the holiday weekend! That looks great. Especially for a hot summer day! I love adzuki beans and have tried making sweet paste and filling in Indian flatbread. I just love the sound of that sweet red bean paste in flatbread! Totally swooning! Hi Monica, I have heard of this dessert before, looks very appetizing. Will be making this. Have a wonderful 4th!! Thanks, Cheri. I love red beans and it's one of those things where I take a spoonful and I just keeping going and going...hope you had a great 4th of July holiday, too! I use kidney beans in dessert, but I have never had red beans in a dessert before. And dessert soup is sounding even better. So I would love to try this sometime. I have seen these sort of desserts before but I've never tried one myself, would like to as I'm curious! Hope you give it a go one day...there are tons of dessert soups and bound to be one or several you'd like. Thanks! This brings back such wonderful memories, Monica! I used to have this dessert often whenever our parents took us out to certain restaurants or after a wedding. My mom would make it once in a while too. I wish I had a bowl of this right now! A chilled version sounds perfect for these warm days we are getting! Hope you and your family had a great holiday weekend! I've come across dessert soups that are more like smoothies in bowls. This one is so much better and spells comfort and has the warm, fuzzy feeling about it.What a wonderful recipe! I want to make this some time soon. Yes, it is kind of like smoothies in bowls...in this case, mine is rather chunky but there are many smooth dessert soups as well. Dessert soups sound kind of odd but so good for those of us who grew up on it. I wish I could go to a dessert house more often and have a bunch of different ones (there are dessert houses/restaurants like that - such fun!). When I was younger, I didn't like red bean dessert soup. But since I haven't had it so long ago, I really miss it. I love your version with tapioca pearls. I still have some leftover red beans, this will be a great way to use them. Thanks for a great recipe! I know what you mean. I like tapioca in everything (as far as dessert soups, I guess!). : ) Hope you're staying cool! This is definitely different! But I happen to trust your taste in food and will give this a try! Must sound strange to those who don't know this type of dessert! Thanks for being open minded! Never even thought beans could work in a dessert!!! Love your adventurous spirit to try something so different! It sounds odd but there are so many of these hot/cold type dessert "soups" in Asian culture. Hope you give one a try one day. The red beans and the tapioca sound good to me! I enjoyed making your glutinous rice balls with the brown sugar soup, and now I definitely want to give this one a try! Learning about the foods of different cultures is so much fun!